As you work with Node.js, you may find yourself developing a project that stores and queries data. In this case, you will need to choose a database solution that makes sense for your application's data and query types. In this tutorial, you will integrate a MongoDB database with an existing Node application. NoSQL databases like MongoDB can be useful if your data requirements include scalability and flexibility. MongoDB also integrates well with Node since it is designed to work asynchronously with JSON objects. To integrate MongoDB into your project, you will use the Object Document Mapper (ODM) Mongoose to create schemas and models for your application data. This will allow you to organize your application code following the model-view-controller (MVC) architectural pattern, which lets you separate the logic of how your application handles user input from how your data is structured and rendered to the user. Using this pattern can facilitate future testing and development by introducing a separation of concerns into your codebase. A local development machine or server running Ubuntu 18.04, along with a non-root user with sudo privileges and an active firewall. For guidance on how to set these up on an 18.04 server, please see this Initial Server Setup guide. Node.js and npm installed on your machine or server, following these instructions on installing with the PPA managed by NodeSource. MongoDB installed on your machine or server, following Step 1 of How To Install MongoDB in Ubuntu 18.04. Before we begin working with the application code, we will create an administrative user that will have access to our application's database. This user will have administrative privileges on any database, which will give you the flexibility to switch and create new databases as needed. You will see some administrative warnings when you open the shell due to your unrestricted access to the admin database. You can learn more about restricting this access by reading How To Install and Secure MongoDB on Ubuntu 16.04, for when you move into a production setup. For now, you can use your access to the admin database to create a user with userAdminAnyDatabase privileges, which will allow password-protected access to your application's databases. This creates an entry for the user sammy in the admin database. The username you select and the admin database will serve as identifiers for your user. Now that you have created your database user, you can move on to cloning the starter project code and adding the Mongoose library, which will allow you to implement schemas and models for the collections in your databases. Our next steps will be to clone the application starter code and add Mongoose and our MongoDB database information to the project. In your non-root user's home directory, clone the nodejs-image-demo repository from the DigitalOcean Community GitHub account. This repository includes the code from the setup described in How To Build a Node.js Application with Docker. Before modifying the project code, let's take a look at the project's structure using the tree command. We will be adding directories to this project as we move through the tutorial, and tree will be a useful command to help us track our progress. This command will create a node_modules directory in your project directory, using the dependencies listed in the project's package.json file, and will add mongoose to that directory. It will also add mongoose to the dependencies listed in your package.json file. For a more detailed discussion of package.json, please see Step 1 in How To Build a Node.js Application with Docker. Before creating any Mongoose schemas or models, we will add our database connection information so that our application will be able to connect to our database. This will give you access to Mongoose's built-in methods, which you will use to create the connection to your database. Because we are running our database locally, we have used 127.0.0.1 as the hostname. This would change in other development contexts: for example, if you are using a separate database server or working with multiple nodes in a containerized workflow. Note that in the URI we've specified the authSource for our user as the admin database. This is necessary since we have specified a username in our connection string. Using the useNewUrlParser flag with mongoose.connect() specifies that we want to use Mongo's new URL parser. This tells the application to use the database connection information specified in db.js. With your database information in place and Mongoose added to your project, you are ready to create the schemas and models that will shape the data in your sharks collection. In keeping with this theme, we can have users add new sharks with details about their overall character. This goal will shape how we create our schema. This definition includes information about the type of input we expect from users — in this case, a string — and whether or not that input is required. This last line makes our Shark model available as a module using the module.exports property. This property defines the values that the module will export, making them available for use elsewhere in the application. With the Shark schema and model in place, you can start working on the logic that will determine how your application will handle user input. Our next step will be to create the controller component that will determine how user input gets saved to our database and returned to the user. At the top of the file, we'll import the module with our Shark model so that we can use it in our controller's logic. We'll also import the path module to access utilities that will allow us to set the path to the form where users will input their sharks. Sending users the shark input form. Creating a new shark entry. Displaying the sharks back to users. This function will be called when a user posts shark data to the form on the sharks.html page. We will create the route with this POST endpoint later in the tutorial when we create our application's routes. With the body of the POST request, our create function will make a new shark document object, here called newShark, using the Shark model that we've imported. We've added a console.log method to output the shark entry to the console in order to check that our POST method is working as intended, but you should feel free to omit this if you would prefer. Using the newShark object, the create function will then call Mongoose's model.save() method to make a new shark document using the keys you defined in the Shark model. This callback function follows the standard Node callback pattern: callback(error, results). In the case of an error, we will send a message reporting the error to our users, and in the case of success, we will use the res.redirect() method to send users to the endpoint that will render their shark information back to them in the browser. This function uses the Shark model with Mongoose's model.find() method to return the sharks that have been entered into the sharks collection. It does this by returning the query object — in this case, all of the entries in the sharks collection — as a promise, using Mongoose's exec() function. In the case of an error, the callback function will send a 500 error. The returned query object with the sharks collection will be rendered in a getshark page that we will create in the next step using the EJS templating language. Keep in mind that though we are not using arrow functions here, you may wish to include them as you iterate on this code in your own development process. Now that you have a controller component to direct how user input gets saved and returned to the user, you can move on to creating the views that will implement your controller's logic. To enable our application to work with user data, we will do two things: first, we will include a built-in Express middleware function, urlencoded(), that will enable our application to parse our user's entered data. Second, we will add template tags to our views to enable dynamic interaction with user data in our code. Adding this function will enable access to the parsed POST data from our shark information form. We are specifying true with the extended option to enable greater flexibility in the type of data our application will parse (including things like nested objects). Please see the function documentation for more information about options. 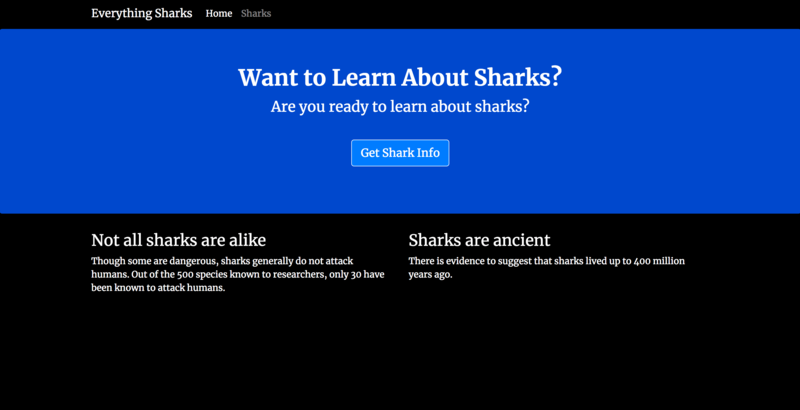 Now, rather than having a two column layout, we will introduce a third column with a form where users can input information about sharks. For an introduction to Bootstrap's grid system, including its row and column layouts, please see this introduction to Bootstrap. In the form tag, you are adding a "/sharks/addshark" endpoint for the user's shark data and specifying the POST method to submit it. In the input fields, you are specifying fields for "Shark Name" and "Shark Character", aligning with the Shark model you defined earlier. 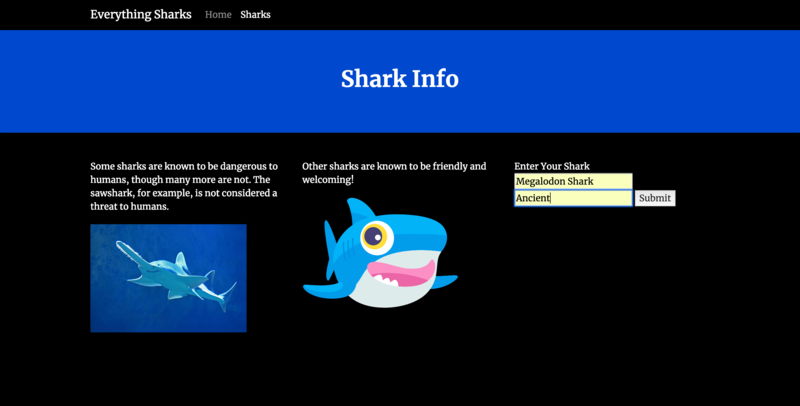 Now that you have a way to collect your user's input, you can create an endpoint to display the returned sharks and their associated character information. Here you are using EJS template tags and the forEach() method to output each value in your sharks collection, including information about the most recently added shark. The app.engine method tells the application to map the EJS template engine to HTML files, while app.set defines the default view engine. Now that you have created views that can work dynamically with user data, it's time to create your project's routes to bring together your views and controller logic. The final step in bringing the application's components together will be creating routes. We will separate our routes by function, including a route to our application's landing page and another route to our sharks page. Our sharks route will be where we integrate our controller's logic with the views we created in the previous step. When users visit our application, the first place we want to send them is to the index.html landing page that we have in our views directory. Each route makes use of the related function in controllers/sharks.js, since we have made that module accessible by importing it at the top of this file. You can now delete the routes that were previously defined in this file, since you are importing your application's routes using the sharks router module. With all of your application components created and in place, you are now ready to add a test shark to your database! Example app listening on port 8080! If you would like to create a new shark entry, head back to the Sharks page and repeat the process of adding a shark. 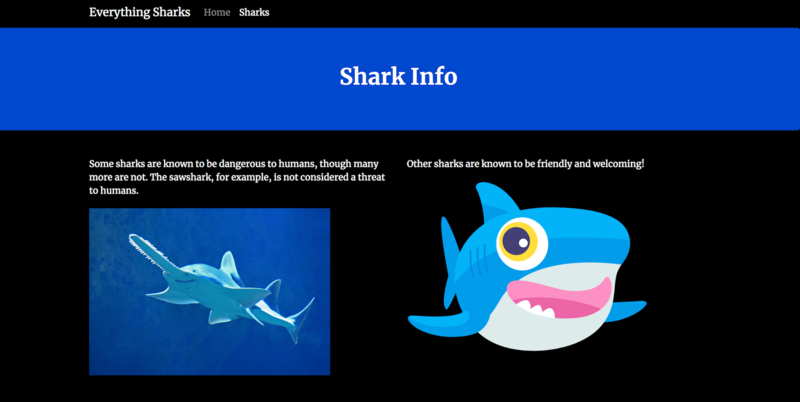 You now have a working shark information application that allows users to add information about their favorite sharks. In this tutorial, you built out a Node application by integrating a MongoDB database and rewriting the application's logic using the MVC architectural pattern. This application can act as a good starting point for a fully-fledged CRUD application. For more resources on the MVC pattern in other contexts, please see our Django Development series or How To Build a Modern Web Application to Manage Customer Information with Django and React on Ubuntu 18.04. For more information on working with MongoDB, please see our library of tutorials on MongoDB.